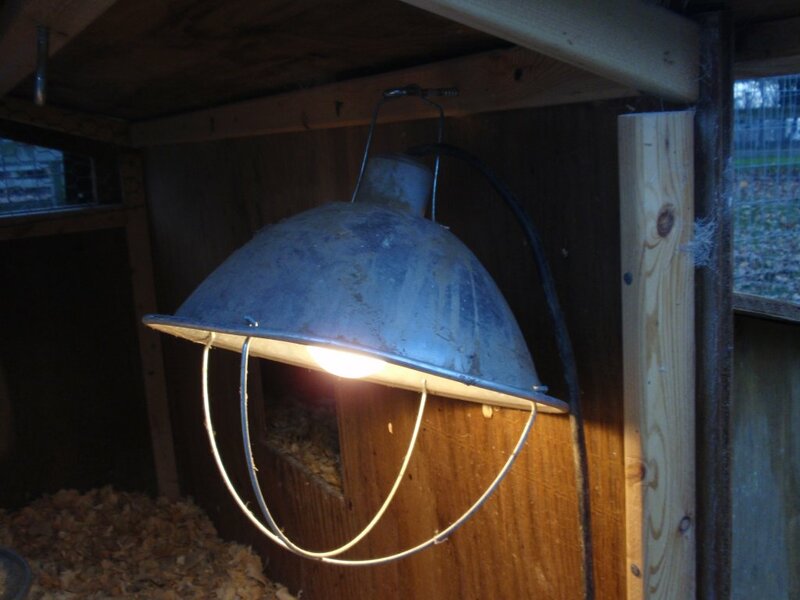 The chicken coop light will increase egg production. 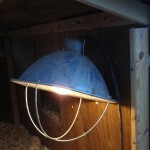 With the days getting shorter and the temperature dropping, I decided to install a light in the chicken coop today. I hope that this will encourage the hens to lay more eggs. The 60 watt incandescent bulb will also provide additional heat inside the coop. This additional heat will help keep the water from freezing. As can bee seen in the picture below, I have taken great care to secure the light inside the coop. That’s because chicken coop lights can be a fire hazard. The chicken coop light is mounted with an eye hook. Imagine going out to check on your young chicks one morning. As you approach the chicken coop you see smoke pouring out of the windows. Where there is smoke there is fire. The chicken coop is on fire! You run for the garden hose, open the clean out door and begin to hose down the pine shavings that have caught fire. The young chickens are huddled in the opposite corner confused and scared. After the fire is out the burnt bedding must be shoveled out. This actually happened about four weeks after my baby chicks arrived in the mail. When the chicks are small they need additional heat. By hanging a light in the coop the chicks can move under the light or towards the edge of the light until they reach a comfortable temperature. I had hastily hung the light I was using for a heat lamp from a screw. At some point the birds knocked it down causing direct contact between the pine shavings and the light. This eventually led to the bedding catching on fire. Luckily, no chicks were harmed in the incident. 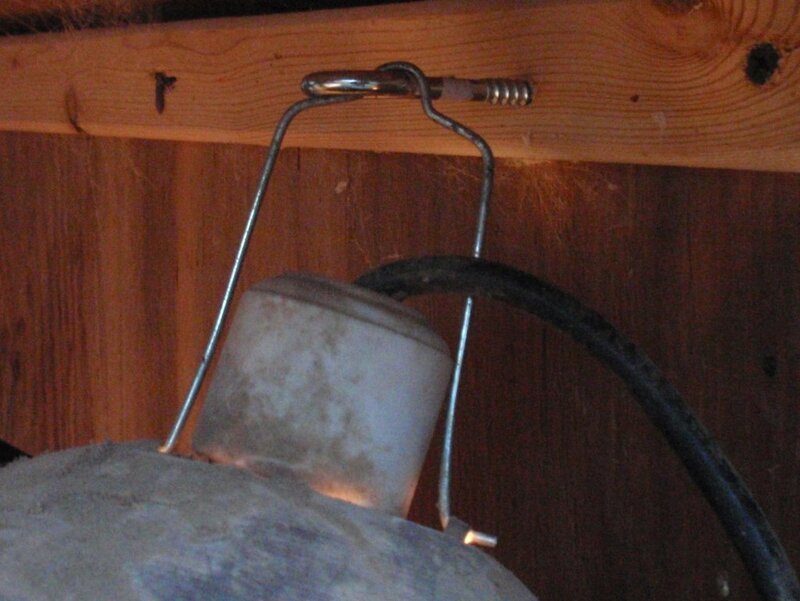 Take care when installing a light inside a chicken coop because it is a fire hazard. I learned this lesson the hard way and won’t soon forget. Raising chickens in the backyard page. I would be VERY CAUTIOUS about putting a light of ANY kind in a chicken coop. We just learned that lesson the hard way. We had a low wattage heat in our hen house all winter long and 2 days ago, while letting out dogs out, I noticed white smoke billowing out of our backside of our property. I soon realized that the hen house was totally engulfed in flames. There was NO way I could save it, the flames were already 15 feet high. We had the light secured with cables ties and we had it mounted with a screw in hook. What happened we believe is the hens were fluttering about in the coop and hit the lamp and caused the light to explode. The hot elements in the lamp landed on the straw/shavings and up it went. We ended up losing our ENTIRE barn, our coop, our greenhouse and tens of thousands of dollars of our farm equipment. Having a light/heat lamp in the coop just is NOT worth it. It’s NOT safe. I’m sorry to hear about your loss. Thanks for sharing your experience and warning.